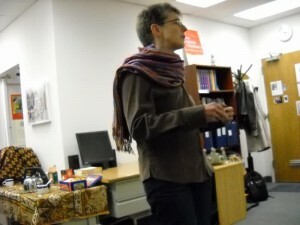 WATER’s Women in Theological Education group hosted an evening of “Women and the Arts” on Wednesday, March 28, 2012. Each artist shared a theological witness through the genres of story-telling, dance, song, and pictorial imagery. The audience was moved, and all left feeling inspired to support the many expressions of womanhood. Lauren Blitz presented her adaptation of the hemorrhaging woman in Luke’s Gospel. She also shared a multimedia presentation focusing on who the hemorrhaging woman could be among us today. She paired a power-point presentation with the song “Come, Touch the Robe” by Pepper Choplin. Lois Cecsarini debuted two of her songs from her upcoming musical, “Biblical Girls: Eve’s Big Fat Family Reunion.” She performed “Made in the Image” and “Rose and Lion” for the group. She has a hit on her hands! A reading of the play debuts on Mother’s Day weekend…stay tuned for more details! Cindy Lapp performed a sassy rendition of Langston Hughes’ poem, “Madam and the Minister” put to music by Betty Roe. This is typically a song she sings with her husband playing cello, however she performed it acapella for the group. The audience loved her performance and was left wanting more from this classically trained Mennonite pastor. Josie Hoover, liturgical dancer and instructor, shared a spirit-filled piece from Donald Lawrence and the Tri-City Singers, “Come Sunday.” Josie choreographed the dance for the dancers from Westphalia United Methodist Church in Upper Marlboro, Maryland. The powerful movements of the dancers showed the impact of releasing women’s energies for good. Clarafrancie Cromer shared her experience in the Gullah culture of South Carolina, featuring prints from the works of John W. Jones and Jonathon Green. She explained the connection between the slave revolt planned by Denmark Vesey in 1822 and the creation of the Citadel in Charleston. WATER’s Women in Theological Education Group has had a very successful first year. Watch this space for future offerings.